To Mary Wollstonecraft, writer, philosopher, advocate of women's rights. From Bernadette Jordan. I am writing to your from the future. Over 200 years in the future in fact. Your portrait is in the People’s History Museum in Manchester. It inspired me to write to you, woman to woman about our connections over time, my world to yours. Amongst your many works and philosophies, the one you are remembered for most is your belief that women are as intellectually capable as men. You have been proved right. Now, in 2016, more women than men study at university degree level. Equality of opportunity is a reality in this country. Women don’t always choose high ranking positions or career paths or leadership roles but many find fulfillment in family relationships and choose this pathway to happiness. The caring roles are undervalued in our society but their value to individuals is immeasurable. You were one of the privileged elite in your era. In our era, we in the West are the privileged elite. You had education and opportunities to express yourself in influential circles. You made a difference to the way of thinking in your time. In our time the world seems a much smaller place. You wouldn’t believe the advances we have made. We communicate at a global level and at the touch of a button; we have instant access to news and information from all over the world. We know of the problems faced by women in other countries. In the West, intelligent, well educated women are using up their time and energy protesting about perceived inequalities that are trivial in comparison to the real stark inequalities suffered by their sisters in other countries. In some countries the plight of women is similar to the plight of women in your age, yet their sisters in the Western world look away. Girls are denied education, women are shut away. They are the property of their husbands, unable or unwilling to show their faces in public. Religious wars are fought by men whose warped religious beliefs include the complete denial of any form of rights for the women who could breathe peace. Your life is separated by mine by more than 200 years. You began the long process of raising the status of women and the success of this is everywhere I look. Women in the West are leaders. Peace and prosperity is here in England. 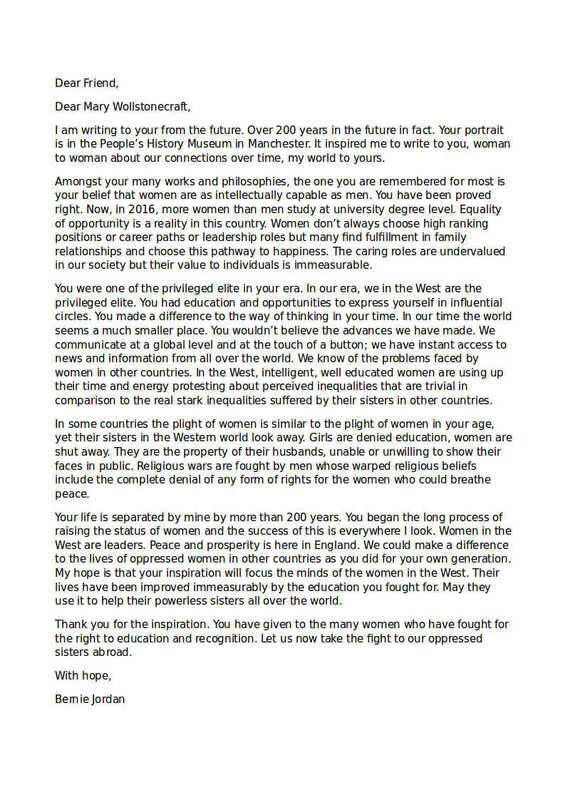 We could make a difference to the lives of oppressed women in other countries as you did for your own generation. My hope is that your inspiration will focus the minds of the women in the West. Their lives have been improved immeasurably by the education you fought for. May they use it to help their powerless sisters all over the world. Thank you for the inspiration. You have given to the many women who have fought for the right to education and recognition. Let us now take the fight to our oppressed sisters abroad. writer, philosopher, advocate of women's rights. Born 1759, died 1797. More information about Mary Wollstonecraft.